The Son of Polish-Jewish immigrants, born in 1938 in Pairs. He spent the early years of his life in Savoy where his family hd him from the Nazi peril. 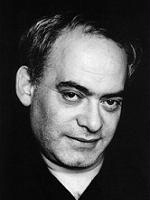 Author and draftsman, Roland Topor studied at the Beaux-Arts school and first published his drawings and stories in the reviews Bizarre, Arts, Le Rire & Fiction. In 1962, he co-founded wthe Panic Movement with Fernando Arrabal and Alejandro Jodorowsky. This resulted in several books including ‘Le Locataire Chimérique’ (1964), ‘ Les Mémories d’un vieux con’ (1975) and ‘Café Panique (1981). Iconoclastic Topor utilized different media in which to share his aburdist and often disturbing view of the world. He was at his best when upsetting life’s apple cart. All his work echoes the mood set by the Panic Movement. As an engraver (a large number of his lithographs and wood engravings wee published by Atelier Clot in Paris) and painter, he created images for the magic lantern in Fellini’s film ‘Casanova’ in 1975, and illustrated literary works, including the complete works of Marcel Aymé in 1977. He designed the decour and costumes for Ligeti’s opera ‘Le Grand Macabre’ in 1978, Poulenc and Appoinaire’s ‘Les Mameles de Tiresias’ in 1985, Mozart’s ‘The Magic Flute’ in 1990 and Jarry’s ‘King Ubu in 1991. His movie posters, notably his European one for ‘The Tin Drum’ were frequently controversial. As an illustrator/graphic artist, Topor was responsible for the odd visual style of the Czech/French mesmerizing psychedelic animated sci-fi feature ‘La Planee Sauvage’ (Fantastic Planet) in 1973, which won the Prix Special at Cannes, and has since become a cult favorite. It is considered a landmark of European animation, and until today is the only feature-long drawn cut-out animated film (The adventures of Prince Achmed used silhouette cut out animation and South Park Bigger, Longer and Uncut used digital cut outs.) The soundtrack has been sampled by many in contemporary hip hop community, such as Madlib. The film was very powerful at its time due to its palpable political and social concerns, cultivated imagination, and memorable animation techniques, and is widely regarded as an allegorical statement on the Soviet occupation of Czechoslovakia. As a screenwriter he penned a number of stories, including the silent comedy ‘La Fille du Garde Barriere’ (1975) and the suerral ‘Marquis (1989). His offbeat puppet show ‘Telechat’ ran for 2 years on French TV channel Antenne 2, with 234 episodes. The show’s main characters were a cat, an ostrich and a fork. Topor the playwright’s productions were like his stories and incorporated plenty of dark absurdism. Occasionally, as with the play Ubu Roi, he would design the sets and costumes too. He had acted before and was at his best playing Renfield in Werner Hozog’s remake ‘Nosferatu’ in 1979. As a songwriter, he proved tunes for Jerome Savary’s Grand Magic Circus. He won the national Grand Prix for graphic arts in 1981 and the Grand Prix des Arts de la Vile de Paris. A large scale retrospectve exhbitiion, Topor: Death and the Devil, was dedicatedt to him at the Stadtmuseum in Munich in 1985.